Very Good. 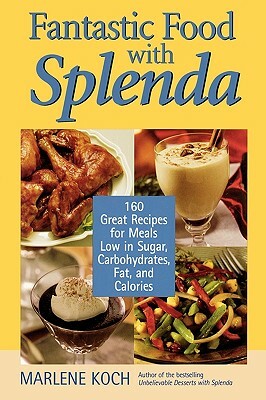 The first of its kind cookbook expands the uses of Splenda, proving that it is versatile enough to be used in many different recipes for all types of meals. Sewn binding. Cloth over boards. With dust jacket. 24 vols. 244 p. Contains: Illustrations. New. 1590770218 Ships from Tennessee, usually the same or next day. Very Good. 1590770218 Ships from Tennessee, usually the same or next day. Good in good dust jacket. This is a used book in good condition and may show some signs of use or wear. Fair. A used book that may have some cosmetic wear (i.e. shelf-wear, slightly torn or missing dust jacket, dented corner, pages may include limited notes and highlighting) All text in great shape! Books by Marlene Koch, R.D.